51589-RB is rated 5.0 out of 5 by 1. 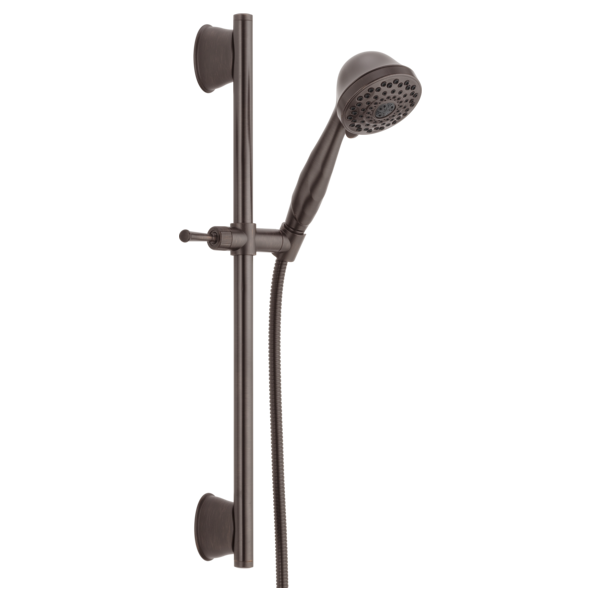 Experience a better shower with the control and flexibility of a Delta® hand shower. Great for showering yourself or your loved ones and pets, as well as for keeping your shower and tub clean. While other products may gather unsightly mineral build-up over time, Delta soft rubber Touch-Clean® spray holes allow any mineral residue to simply be wiped away for an instantly refreshed look – with no need for soaking or the aid of chemical cleaners. The pause setting gives you ample space for shaving, lathering and other shower tasks, then easily restarts the water with the temperature where you left off. This spray setting helps you conserve water, so you can worry less about depleting your supply of hot water - and you help the environment too. Delta WaterSense labeled faucets, showers and toilets use at least 20% less water than the industry standard—saving you money without compromising performance. Can you change the angle of the shower head to point down/up? Is there a recommended shower valve that goes with this head? I see that the shower head can be adjusted up and down, I am wondering if it can be adjusted to point up instead of down. So, can the shower head be adjusted clockwise or counter clockwise and be adjusted up and down. I bought and installed this unit but I can't figure out how to change the angle on the handheld bracket. How do I get the handheld mounting bracket to change angles? How long is the hose on this product? Can the shower head go on either side of the slide bar? how does the slide mechanism work - how do you adjust the height? Is it stable?